Anyone who visits ByteMyVdu regularly, will have noticed by now, that I have something of a soft spot for vintage Apple technology. Not that the new stuff is bad, its just pretty expensive and well it’s not old or obscure enough to feature here on ByteMyVdu. Several weeks ago while doing a spot of cleaning, I found my 1st Generation Ipod hiding away in the back of a drawer. I had all but forgotten about the thing, having taken to using my phone for playing my music while on the move. However finding the Ipod gave me an idea. Would I find it easier to use the Ipod then my phone for my general music needs? I have to admit I do tend to avoid abusing the MP3 player feature on my phone, so I don’t end up draining the battery. After three hours on charge, the Ipod displayed “Charged” on its little LCD screen. By now, the original batteries in most 1st Gen Ipod’s are well past their prime. I knew mine would at least hold some charge, as I had replaced it only a couple of years ago. Thankfully I discovered the battery held enough charge for a couple of days use. Long enough for me to perform my little experiment. As I still use an upgraded G4 Pismo as my backup blogging machine, I pretty much had everything I needed to get the Ipod up and running again, e.g iTunes and a Firewire port. After a couple of hours syncing the Ipod with my music collection, I was rocking and rolling, if you’ll pardon the pun ;-). The first two days went by smoothly, I found I was listening to more of my music in the car then usual. Normally I stick on whatever album I have in the car. Now with the Ipod at hand, I was able to bring more of my music with me, without filling the car with CD’s. Job’s really was right with his “Thousand” songs in your pocket, the Ipod really did doom portable CD players and later CD’s as a viable medium. Another aspect to using a 2001 Ipod, which I found gratifying, was the presence of hardware buttons and a scroll wheel. In an age of touch screens, it was refreshing to have physical controls for a change, there is something to be said for tactile feedback. As humans we spend our days interacting with the world through sight, sound and touch. Through repetition and muscle memory, I personally believe physical buttons permit a degree of dexterity which touch screens have yet to achieve. Before my first touch screen phone, I could text a friend on my Sony Ericsson, while only glancing at the screen. This was solely because I knew the feel of the phone’s keypad by heart. Compared to the Sansa Fuse+ I had bought a year ago, the 2001 Ipod feels vastly easier to use. The user interface is smooth and easy to navigate, this is primarily due to its intuitive layout and simplicity. Whether we have Steve Jobs and his passion for perfectionism or inventor Tony Fadell to thank for this, is really anyone’s guess. What cannot be denied is that together they invented a groundbreaking product, which would eventually lead to the invention of the iPhone and iPad. The first two weeks really were very interesting, as I noticed a change in my habits. Perhaps it was the novelty of using the Ipod, but I was listening to more of my music. Ordinarily the only time I get to listen to my CD’s is on my stereo or in the car. So getting through them can take a while. The process of choosing which albums I wanted to import, forced me to think about what I was listening to. Unlike the ‘on mass drag and drop’ I usually do with my Sansa or phone with my main PC. The Pismo has only a small hard drive, so I had to pick and choose which CD’s I wanted to import. Did I want more classical music over 80’s pop? While on the subject of importing music, am I the only one who finds it amusing, that Apple call it “importing” while Windows media player refers to it as “Ripping”? Working within a confined storage limit really improved my playlist, whittling out music I thought I wanted, but never ended up listening to. The original Ipod has a 5Gb or 10Gb internal hard drive, mine however has a 15 gig drive. As the original drive failed and I replaced it with one bought off eBay. Compared to newer models, this is admittedly small but still how much music can you get through in a week? 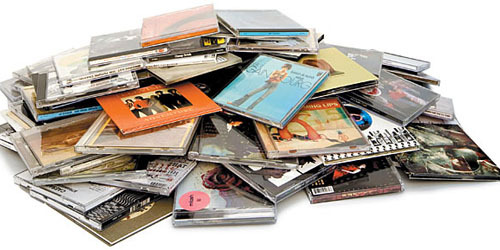 In two weeks I had not listened to all the albums on my Ipod’s hard drive. Hmm I’m beginning to see why I own three messenger bags, aside from the fact one of them has Pac-Man on it. I can’t really berate the Ipod too much for it’s weight. When you think about the technology available in 2001, it really was cutting edge. There is a story told, that when Steve Jobs was presented with the first prototype of the Ipod, he said it was too heavy. 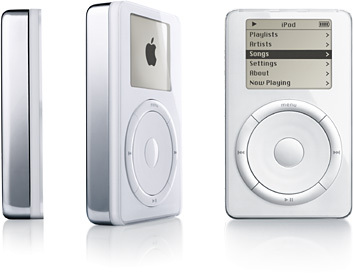 Apple engineers explained the complications of designing the Ipod and that it simply was not possible to make any smaller. After a short pause, he walked over to a nearby aquarium, leaned over and dropped the Ipod in the water. When the Ipod hit the bottom of the tank, bubbles came out of it and rose to the surface. On the third day, I was travelling in the car with my girlfriend, who is not particularly keen on Apple products. She was using the Ipod to select some music to play in the car. Simple enough you would think, except it wasn’t. In fact on her first attempt she was able to lock up the Ipod, which could only be recovered with a hard reset. I’m convinced the Ipod was picking up her negative vibes and decided to be grumpy. Later in the day it froze once more, which is when I decided something was wrong. I previously used the Ipod on my Windows PC, so it was formatted in the Fat file system. I decided to perform a restore via iTunes, returning the Ipod to a native Mac OS format. This is when I discovered another problem. Since Apple made the move to the Intel chipset, they have dropped all support for PPC hardware. The latest version of iTunes for the Pismo running Tiger, is 9.2.1, as such it will not connect to the iTunes store or even the update servers. Something I needed if I wanted to restore my Ipod. I could feel doom looming over my venture to bring back my trusty Ipod, how could I restore my device without a connection to the iTunes server? That’s when it struck me, had Apple ever offered the firmware restores for download? Not everyone had the internet back early 2000, surely Apple took those people in to consideration. As it turned out, they had and after an hour looking online I was able to find a copy of the file I needed “Ipod20060628.dmg”. The Ipod updater supports six different devices and not just the 1st Gen Ipod scroll. So if you own an original Shuffle, Mini or 3rd Gen Ipod, this download might be of some use to you. After running the utility, the Ipod rebooted, formatted now in a Mac OS file system, iTunes quickly detected the device and asked me if I would like to set it up. It could be my imagination, but I found synchronising 5-6gb of music through firewire went much faster then over USB to the Sansa Fuse. Part of the slow down could be due to the speed of the SD card I have installed in the Sansa. Firewire was a short lived feature of the first and second generation Ipod’s, with Apple opting for USB in later models. The switch had other benefits, such as a proprietary 30-pin connector. Which opened up the door for manufacturer to design a variety of custom speaker systems which the later Ipods could dock with. I’m still using the 1G Ipod and I think I will continue to do so for the foreseeable future. It saves me from draining my phone battery and syncing my music with iTunes is painless, the only problem I can see will be filling my Pismo’s hard drive with music. I have plans to eventually replace the internal drive of the Pismo with an solid state drive, so we shall see how that works out. I also need to buy a new lithium battery, as I’m only getting a maximum of two days use from the Ipod, when really the device should be lasting a week before needing a charge. For the vast majority of people, carrying an Ipod in addition to their phone is too much hassle. Your typical smart phone does a good job doubling as phone, camera and music player. If however, like me your battery conscious or one of those people who like using a phone as a phone and nothing more. A personal music player is probably still a useful tool to own. This past month has proved to me that while the 1st gen Ipod might be considered an old timer, it is still a useful device. Less clunky then a personal CD player, the experience is reminiscent of the Walkman. I love using this device, I’ve had friend ask me about it and then get excited when I tell them it’s the first Ipod, an icon piece of history. I hope you all had a frightening time, with gouls, vampires and ever scary blue screen of death! Ugh even just mentioning it’s name sends a shiver up the spine..What ever you do, dont say it three times in a row, unless you wish your computer to crash, your hard drive to melt. For the past few weeks I have been researching new material to place here on ByteMyVdu, one new feature will see episodes of MrVestek on BMV, covering a variety of subjects, such as video games, Linux and the Raspberry Pi. I recently had the pleasure of interviewing Cameron Kaiser, project leader for TenFourFox, a port of Mozilla Firefox for PPC based Apple computers. We discussed how the project began, as well as the challenges he and the team faced while developing a modern browser for old PPC hardware. iBook G3’s are one of those Apple products that you either love or hate. Plagued with problems, the iBook is remembered more for the notorious BGA video fault that saw a number of iBook owners file a class action lawsuit against Apple. While I swore never to touch another iBook, I recently found myself doing just that. In the next week I shall be covering the iBook, how to repair and perhaps prolong the life of these little computers. S9920 otherwise known as a Samsung S3 mini clone from China, is slowly becoming very popular. Not surprising given it is half the price of a real S3 mini and for clone, still holds a decent hardware spec. I had recently bought one and discovered the good the bad and the ugly side to this doppelganger.